Does it still feel like your day isn’t long enough? That you aren’t keeping up? That you have too much to do and not enough time? It’s as if the world is getting faster and faster and the days are going by so quickly. I’ll bet you have lists of lists of lists to accomplish. Don’t you? I get it. I was just like that. I would wake up with my heart pounding and the lists of things to do that day would start rolling in like the beginning of a Star Wars film. Getting ready for my day I was already hyperventilating and adrenal fatigued. Then I got sick. My adrenals just had enough. I lost all energy, felt weak, couldn’t think and my hair started to fall out. Mono? Extreme Adrenal Fatigue. My body was saying, “Ok, if you’re not going to slow down then I will have to force you to slow down”. So, I called in all the troops, my Naturopath, my Therapist and ramped up the massages and got back into yoga. All of this helped of course, but it was temporary because my frame of mind was still in fight or flight mode and I still felt like I wasn’t doing enough to progress or be better or to resolve my divorce more quickly. I know you’re a super human and you can handle everything that life puts in your way. You tell yourself you need some “retail therapy” and end up buying stuff you really don’t need. You tell yourself that bingeing on foods is OK, because you’ll start fresh and go on that diet on Monday morning. This mantra changed my perception of myself. Instead of seeing myself as lacking, I was able to shift it so that I became content with who I was in that situation. Then the feeling of contentment grew to all areas of my life. 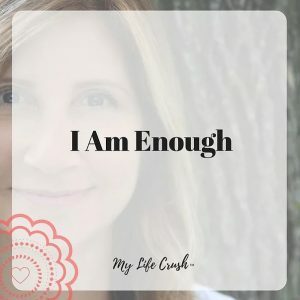 Write “I AM ENOUGH” in red lipstick on your mirrors, on stickies throughout your house, on your cell phone and computer screen saver, in your car and wherever you can see these words. Say them first thing in the morning and before you go to bed. You are beautiful, intelligent and you have everything you need within yourself to make it through anything that life throws at you.